Meet Jane. Jane is fun, quirky, straightforward, very creative and a whole lot spontaneous! I had the pleasure of spending all last week with Jane Davies on the Sunshine Coast of B.C. 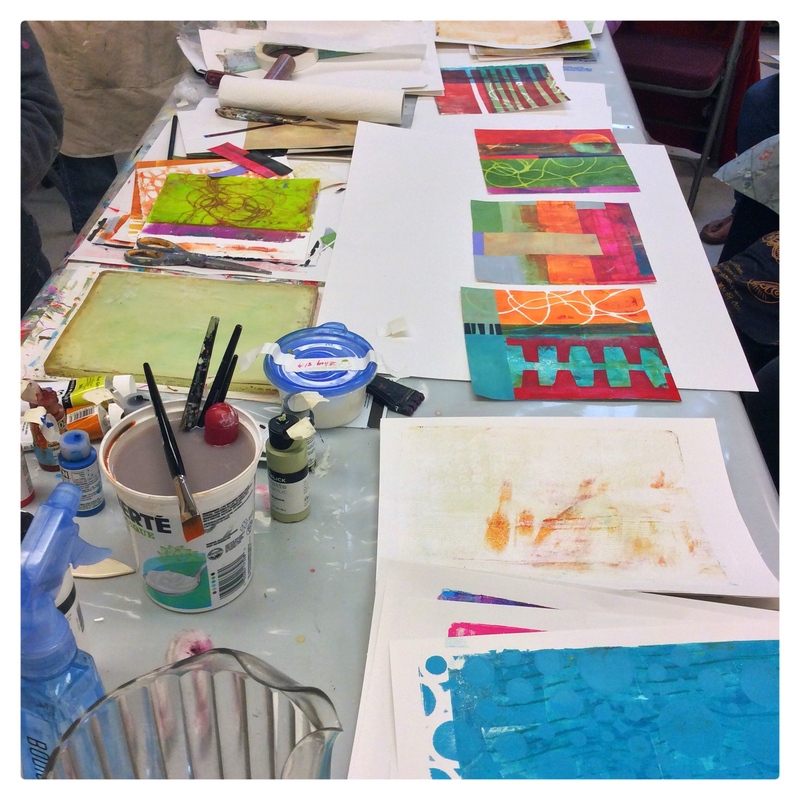 Three days of Big Fat Art and another two of Monoprinting with the infamous Gelliplate. I was definitely in my happy place spending long days just creating with no means to an end, making unexpected marks, combining new colours and exploring lots of layers. 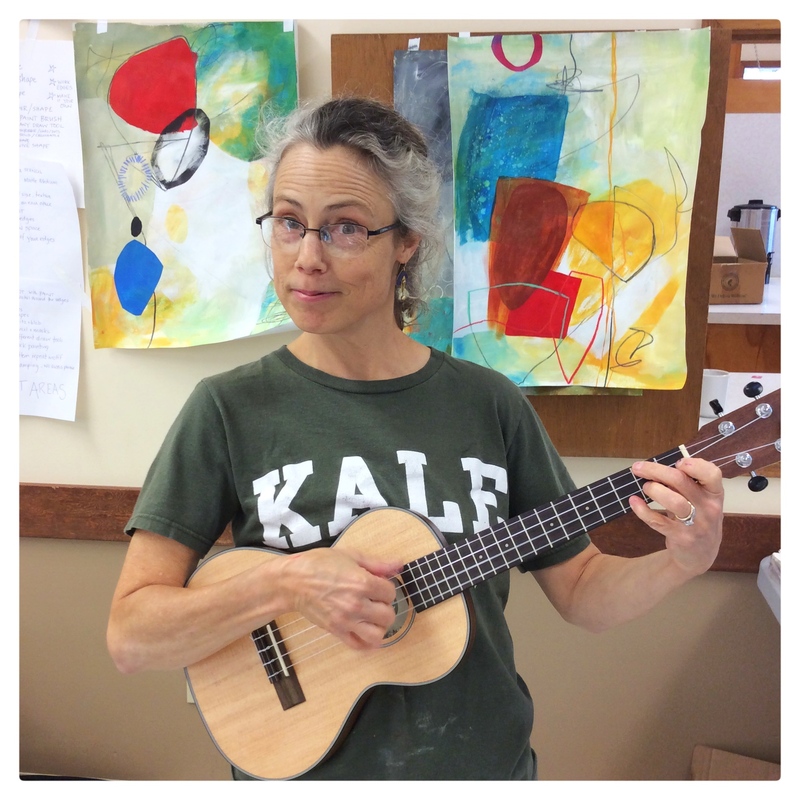 A little ukulele playing did not hurt the process.... We spent the week exploring fast, carefree mark-making with various mark making tools, charcoal, water-colour crayons, ink and pastel. 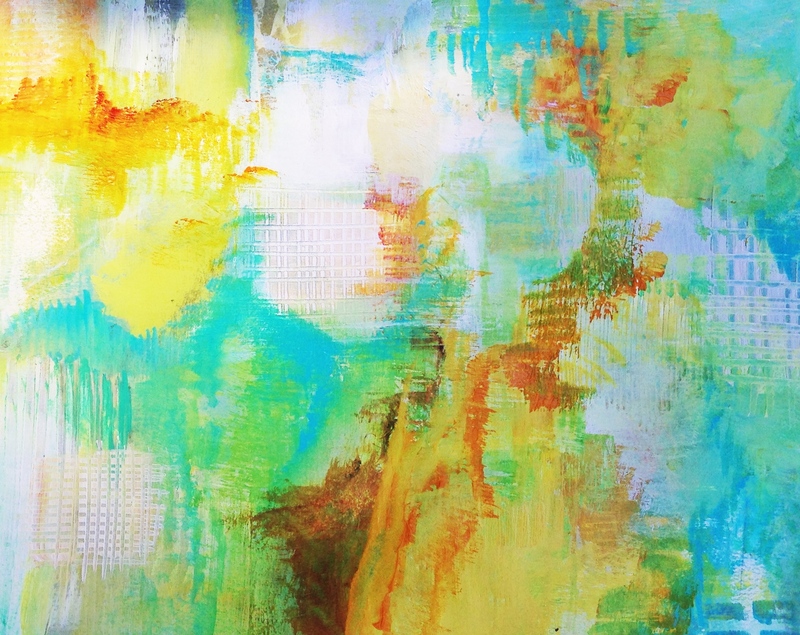 We combined unexpected colours, playing with opaque and transparent colours. We added texture through the use of paint and handmade collage papers.We learned how to add lots of depth to our work. We even added a few drips here and there. We had a lot of laughs and a lot of fun. Most importantly though we silenced the inner critic within and created with no concern for what is right and what is wrong. To be truthful, it wasn't easy. It can be a little disconcerting to try new things and work against principles that have been ingrained in you by every art teacher and book out there. What I loved about Jane was her constant encouragement to push past what we already know and try something different, and her love for the creative process versus the finished outcome. For me that included No imagery - no flowers, birds or other whimsical things flying around and, gasp, maybe putting some purple in my work. Ok, some things I just couldn't manage to push myself past, BUT look how awesome it looks below with the reds and yellows! This, once again, reminds me of the importance of keeping an art journal. A safe place to try out new marks, colours and techniques. A place to make some really bad art with hopefully some unexpected surprises of greatness! Here are a few of my works in progress. A few things I learned about myself: I love strong, bold colour. I love texture, but not necessarily patterned texture. I love depth.I love discovering little marks hiding underneath different layers.I love organic shapes. I love a wee bit of black in my work. I love contrast. I am a wee bit scared of the abstract. I still don't feel comfortable with the tension it often adds to work. I also learned that I need to add more areas of rest and lightness to my work. I need to take a deep breath and work on the details of each smaller piece within the bigger whole, to be more mindful and to slow down and sit with a piece before I call it finished. I need to add more interestingness to my work either by contrast, line or layering. What a great week! I could spend all day, everyday, creating. For more info on Jane please visit her website. Do not miss out on her tutorials tab. Jane is very generous with her knowledge and discoveries and has dozens of great video tutorials to share. 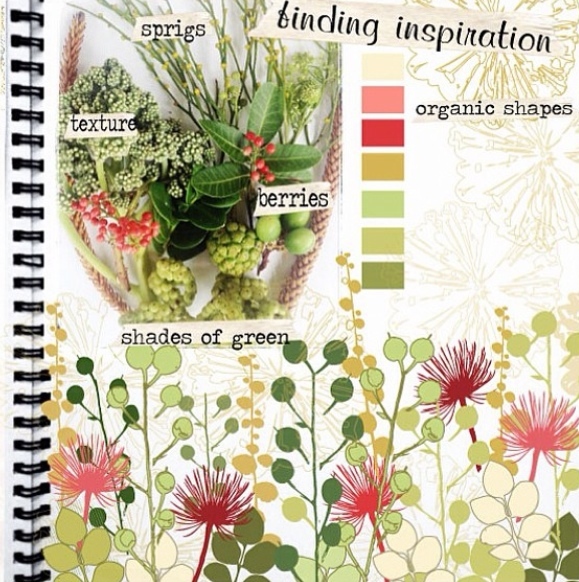 Small doses of creative inspiration! She also offers online and real life workshops. Sign up for her newsletter for more info on upcoming courses. If you have any questions, please do not hesitate to send me an email. Have a great week! I hope the sun is shining and the autumn leaves are in full color for you. I have been asked to join in on a blog hop by my good friend Deborah Velasquez. I have just spent the past hour drifting backwards through the hop and I still can't find its origin, but it has been well worth my time as I have stumbled upon some beautiful artists , writers and like minded souls from all over the world. One of which lives just down the mountain from me! Today I will answer a few questions about my work and then point you in the direction of a few other creative souls who inspire me - Deborah Velasquez, Margot Miller and Laura Wooten What are you working/writing on? In typical fashion, I have many projects on the go right now. I hop about daily from one project to the next, working on what inspires me at the moment. My main focus this summer is centered on an illustration project I have for The Whistler Survival Guide, a directory for newcomers moving to the area. It is my first illustrating gig and while I am finding it challenging, I am in awe of how much I am learning. 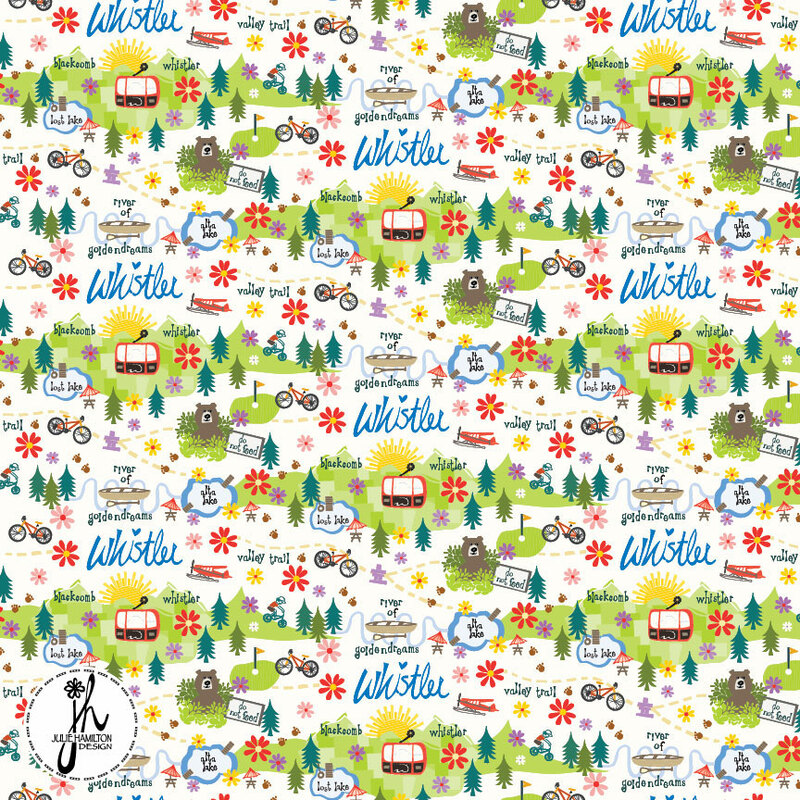 There will be more here on the blog in the fall when it is released. 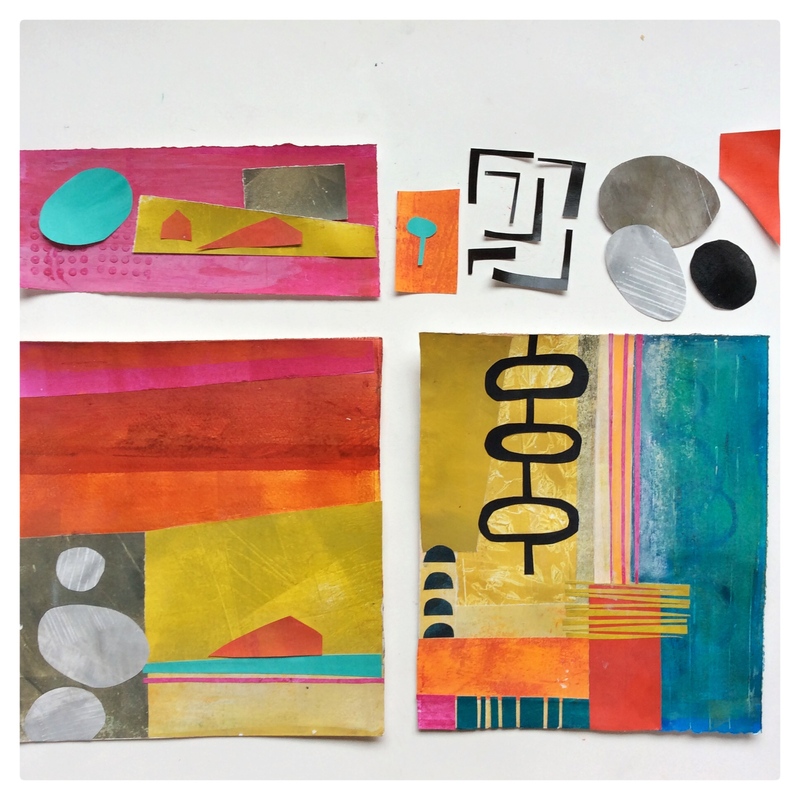 My summer fun project involves creating a collection of 8 by 8" mixed media pieces. These mini works have become a a part of my daily creative practice.They are my go-to when I feel the need for a little painting, spraying and stamping in my life. They make me happy. I have recently written a post about the process here. 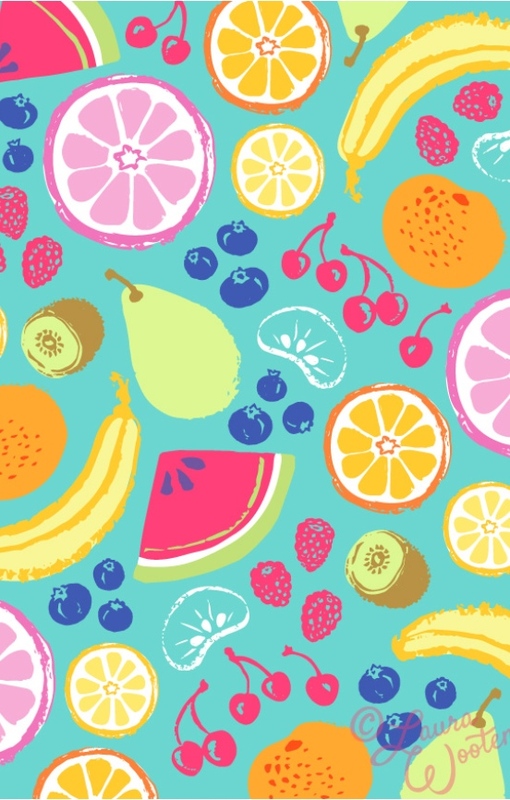 Mixed in with all of this is my art licensing work , monthly submissions for A Fresh Bunch and a new collection coming soon to Modern Yardage. Life is busy, but very enjoyable! Why do you create? One of my favourite sayings and one that provides me with daily inspiration and the desire to create. Never lose your sense of wonder Six words that allow me to travel through life with eyes wide open I am visually inspired by colour, texture and shape. My heart starts racing, I feel a little tingly all over and I can't wait to dive into my art journal when inspiration strikes. I love all the endless possibility that creating art provides. I love immersing myself in a theme and exploring different ways of representation. Simply put ~ I love the way art makes me feel. When I am not creating I am in search of what to create next. It has become what makes me whole. How does your creative process work? I work best in short bursts of creative chaos. My paintings and mix media work are all intuitive. I start with marks and gradually move into texture and colour. I observe my mood and what is happening before me on the paper to dictate the direction the piece will take. I can often be found lying on the couch, my artwork propped up before me, with eyes squinted as I turn my piece this way and that, hoping that something...anything.. will materialize before me. 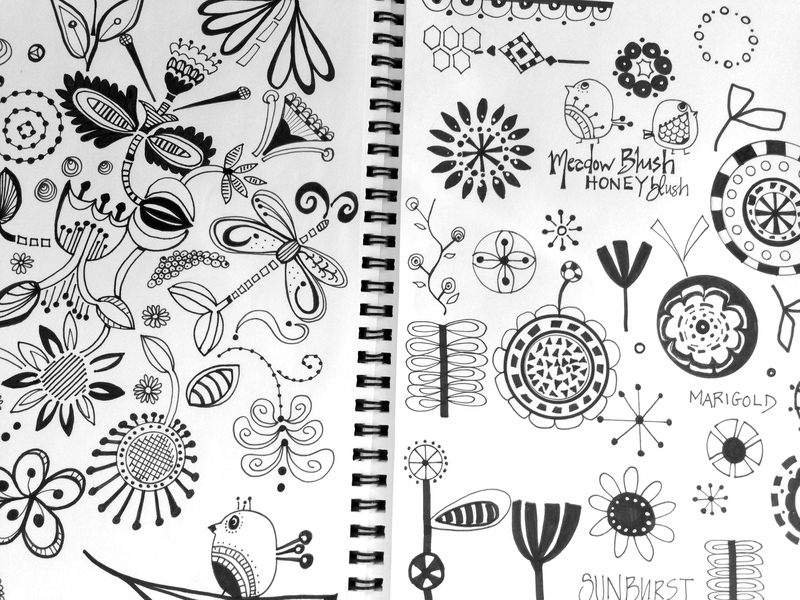 My surface pattern work is a little more structured and usually focused around a collection of motifs.I love to doodle and my sketchbook and pen are never far from my side. Life here becomes a little more computer oriented as I have to scan my work in and pattern in Illustrator. I love the combination of both the structured and unstructured. It allows me to play and experiment with new techniques. Oh how I look forward to the day when I have mastered all of the Adobe programs so I can express myself in all mediums.. Ahhh... big sigh..that was a lot of writing in one sitting. Now, onto the women in my life that inspire and motivate me. Some I know well and others I am in the process of getting to know.I chose to reach out to them in hopes that they would share and learn a little bit more about what makes them tick. Deborah Velasquez I first met Deborah through Kelly Rae Roberts Flying Lessons. I believe we originally connected based on a similar love for seeds and pods . Our friendship grew as we continued on a similar journey with The Art & Business of Surface Pattern Design and then onto Make Art That Sells. She is my go-to girl in times of creative need, both good and bad. She brings a smile to my face. 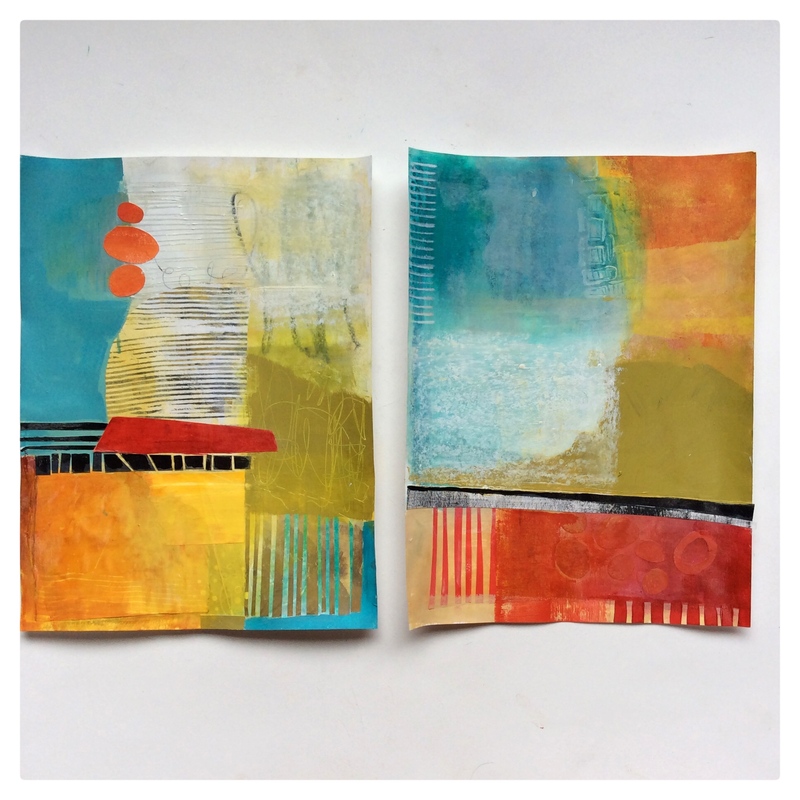 Please pop back to her blogpost here to learn all about her work and creative process. Her work is modern, sophisticated, graphic and bold with a unique colour sense and reflects her simplicity for the love of line. 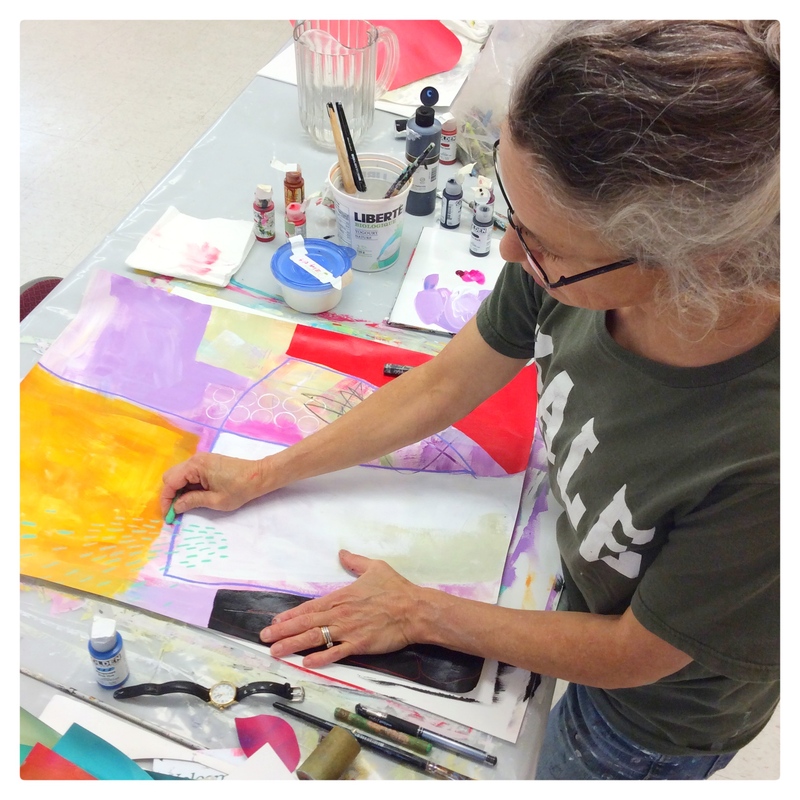 Deborah loves the mixture of design, words, art and craft. She has a very unique way of combining them all together. Watch out for this one! 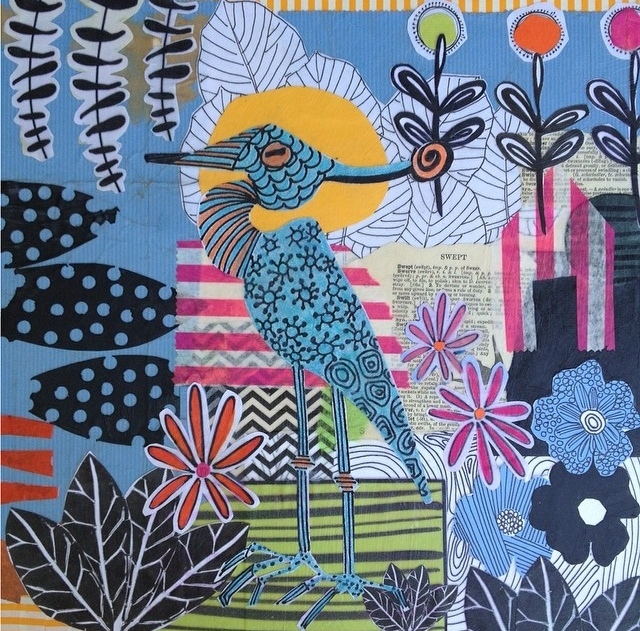 Margot Miller I joyfully came across Margots work in Make Art that Sells. I now follow her daily on Instagram at @margot531 (#scenesfrommyscreen) This woman is multi-talented and funny too. 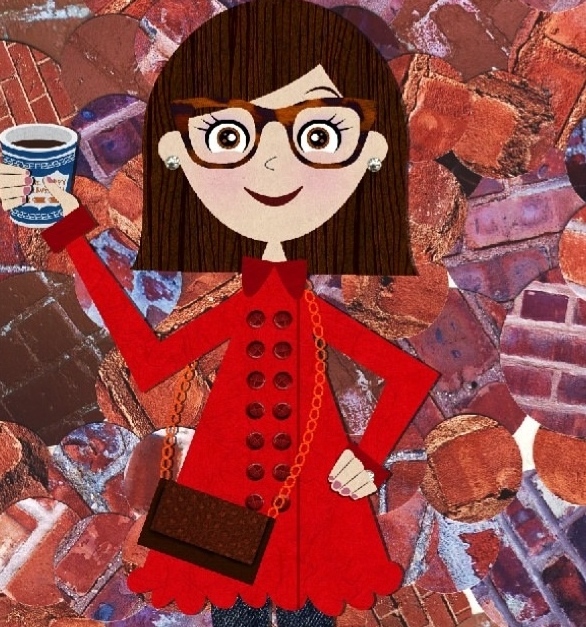 Meet Margot ~ a collage illustrator from N.Y. She is a bit of a tweetaholic and likes her coffee too.. I think we could be friends. Check out her website! 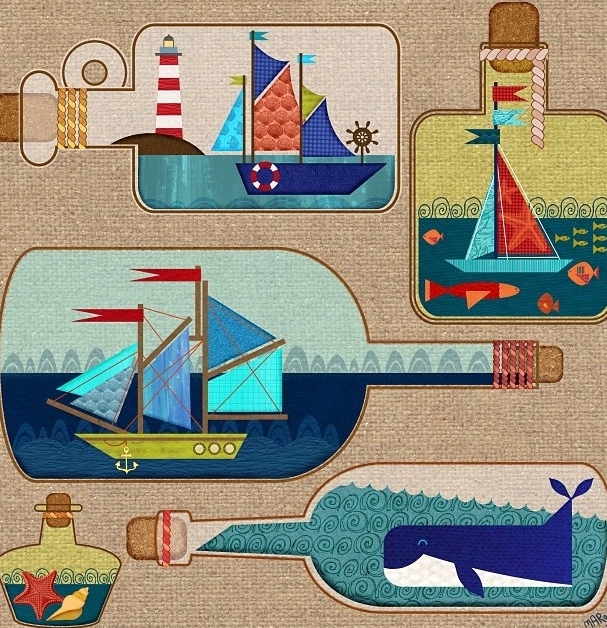 I wish she would give tutorials on how she creates her lovely work... Beautiful colours, shapes and texture! I love this piece she made for Make Art that Sells. 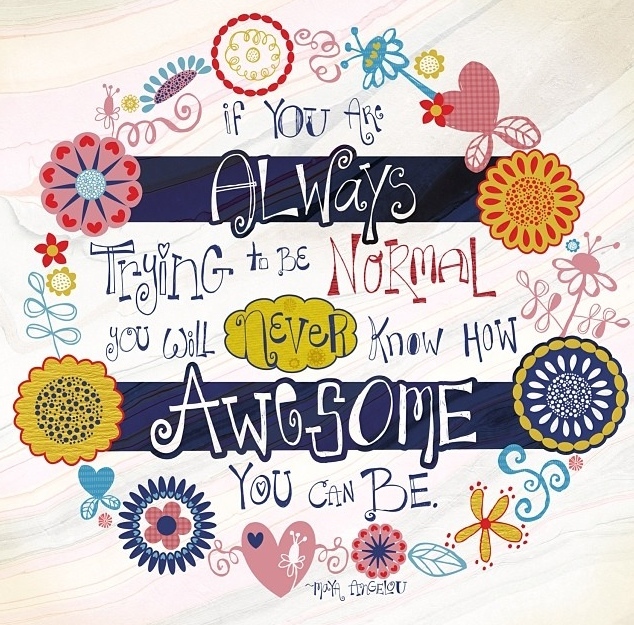 Below is a hand lettering piece she did for a friends book launch blog hop. Pretty awesome. Laura Wooten Next up is Laura Wooten. 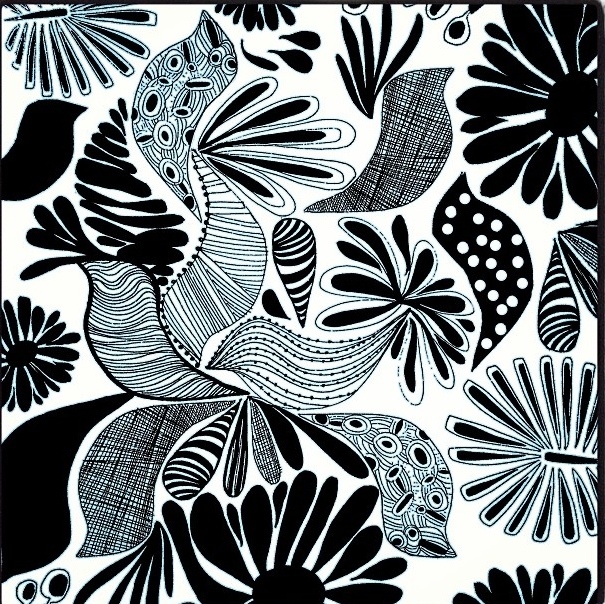 Laura has been on a similar path with continued studies in both the Art & Business of Surface Pattern Design and Make Art that Sells. I was thrilled when I reached out to her to be a part of the bloghop and she said Yes! I love her 52 collage project - creating a collage each week.This has inspired me to no end and makes me want to try. 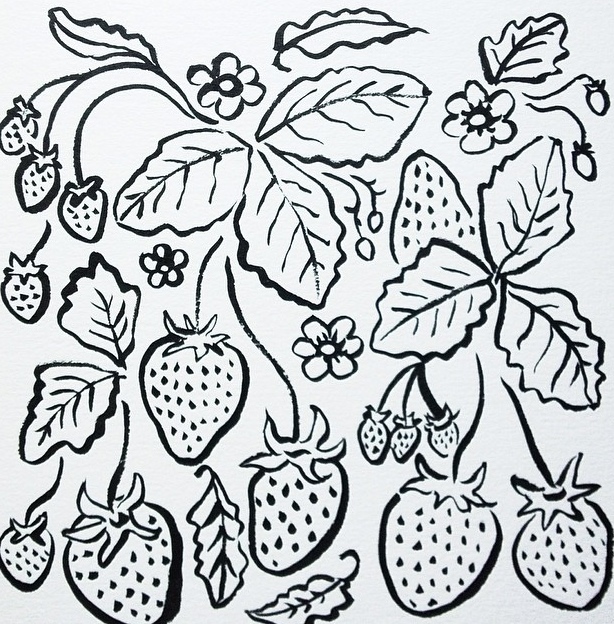 I admire her beautiful hand drawn sketches and prints. The colours are just beautiful - I love the vintage feel. 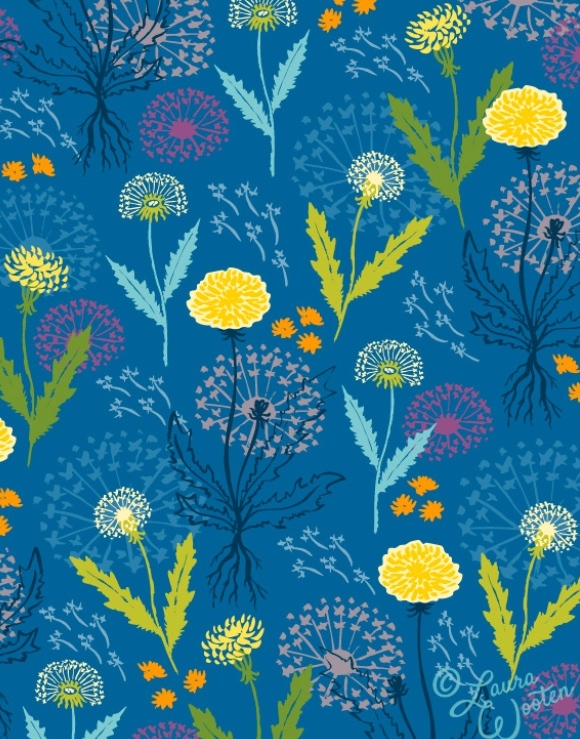 Her website is full of lots of painting and pattern goodness. Laura also instagrams daily. I have been enjoying her daily sketch project. You can visit her here on Instagram These women will be blogging about their creative lives next Saturday and introducing you to other creatives that inspire them. You just never know who you may meet so be sure to drop by! Saying YES to Daily painting! There is a crazy part of me that is thinking that I need to start painting everyday. I am not sure where this desire has come from, but with each passing day this need grows stronger and I am now thinking that maybe it's not such a crazy idea. There is a small part of me that gets a wee bit nervous thinking about it, let alone coming right out and saying it, but then I just have to remember that it doesn't have to be a big deal. It doesn't have to be a finished, ready to hang, kind of anything.It can be simple, something abstract and it definitely can be small.It doesn't have to follow all the rules. It can be done in an hour and it can be done on paper. I do not want any unfinished canvas staring at me guiltily. It can just be.... I have no clue where this idea started. Well, that's not entirely true. I have a small inkling where it all came from. A passionate group of creatives that I hang with got me thinking about it! 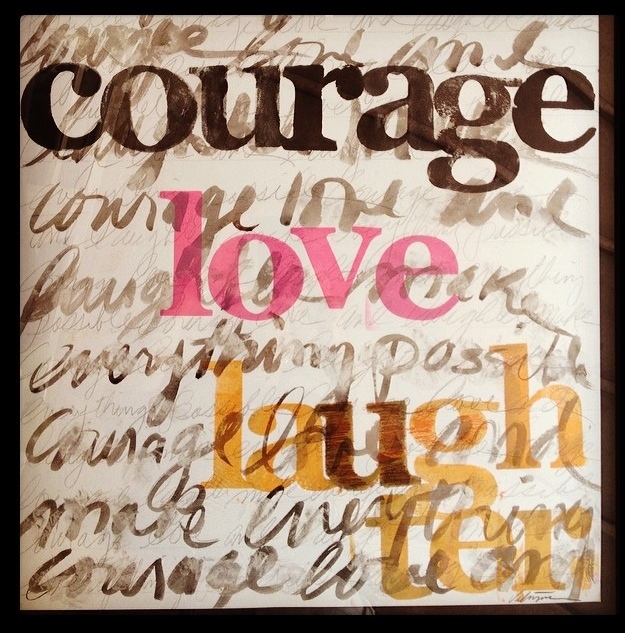 A new e-course, Daring Adventures in Collage, offered by Mati Rose got me really thinking about it! I couldn't help myself, I signed up for it. I know I promised myself I was done with courses for a while. I need time to absorb all I have learned in the past year,. BUT the thing is, I am soo excited for it to start. Counting the days kind of excited. I think it is just the combination of this excitement and the freedom it offers to just create for the sake of creating that inspired me. I think I am just craving some time to making marks, ripping up some paper and playing with colour. Intuitive painting, my style.No plan and definitely no preconceived notion of what I am suppose to be creating. It's the summer so why not! ?I want to play. I promise I will get all of my other work completed before I start. This painting was a work in progress for some time. A mark here and there, a splash of ink and a whole lot of experimenting! It was fun and definitely a learning experience. That, my friends, is exactly what I am hoping for with this crazy idea! If you have any thoughts, suggestions or maybe a support group you can recommend, please do not hesitate to contact me. Or maybe you want to join in? The more the merrier. I will keep you posted on what I decide to do! I am at it again! Spaying, splashing and stamping paint and it feels oh, so good. 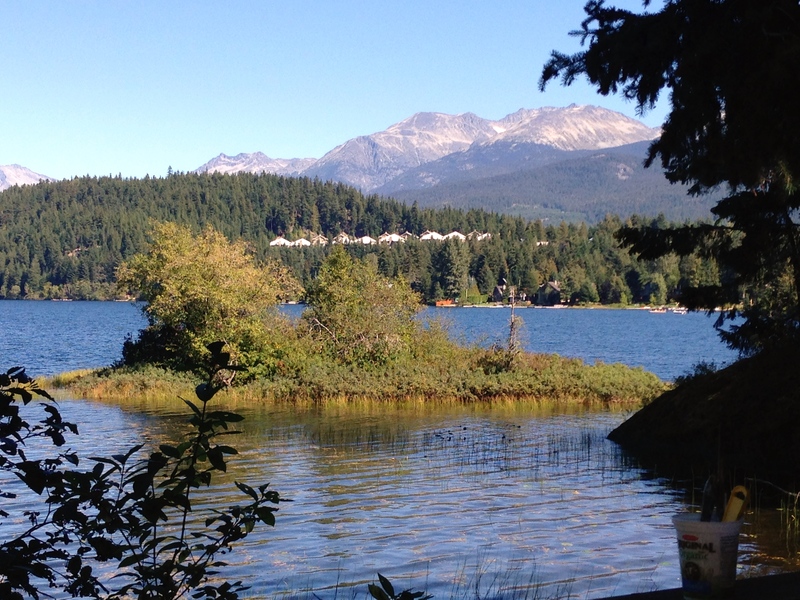 We are very fortunate to have the use of the Station house on Alta lake in Whistler to paint, sketch and just be creative. Beautiful views, the sound of the lake and wind through the trees, painting with like-minded souls. Pretty awesome! It felt so liberating to just play with all my mark making tools ~ exploring different brush strokes and paint combinations. I didn't produce anything, or I should say, I didn't finish a painting, but I learned so much in the process. All lessons I can apply to my sketching, surface pattern and digital skills. I love the intuitive approach to painting. No pressure to recreate a picture or get tight trying to represent something. The goal is to be messy. Create lots of layers. Surprise yourself with under layers peeking through.It adds so much depth to your painting. I find the most interesting paintings are those that have a little something just waiting to be discovered.I love a painting I can come back to again and again, each time discovering something new. Loose. Free. Big! 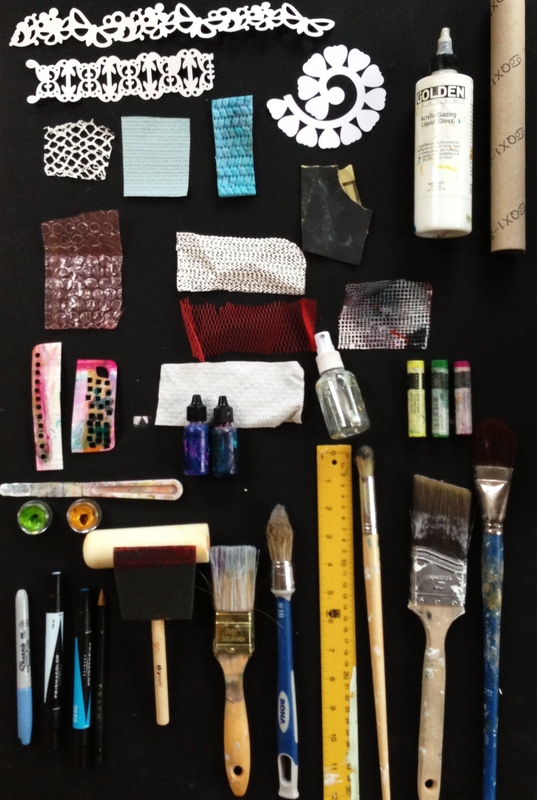 Time to get out your mark making tools! 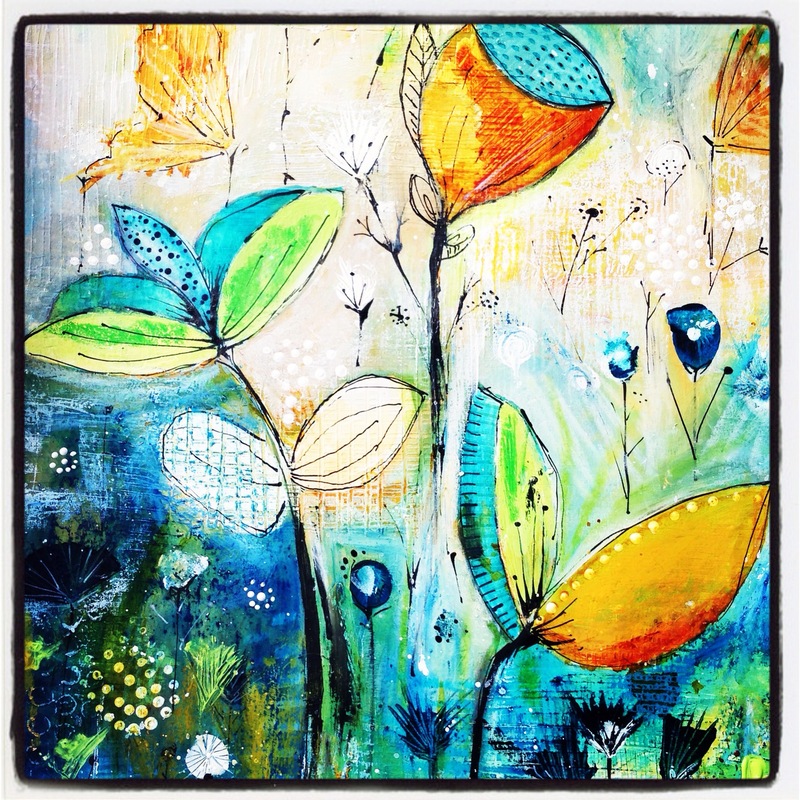 Flora Bowley's Bloom True class is coming to you! 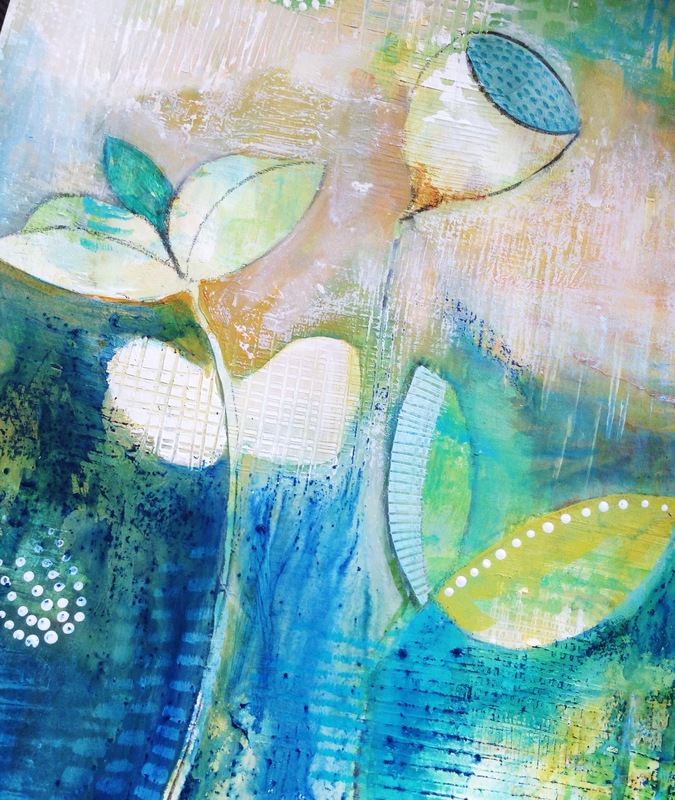 I have written many blog posts on Flora Bowley. My admiration runs deep for this woman! I love her story.She has put herself and her art out there and it was not an easy task for her. I think she best defines brave and bloom. She has taught me how to let go and discover my own personal painting style and helped me along on my own personal creative journey. 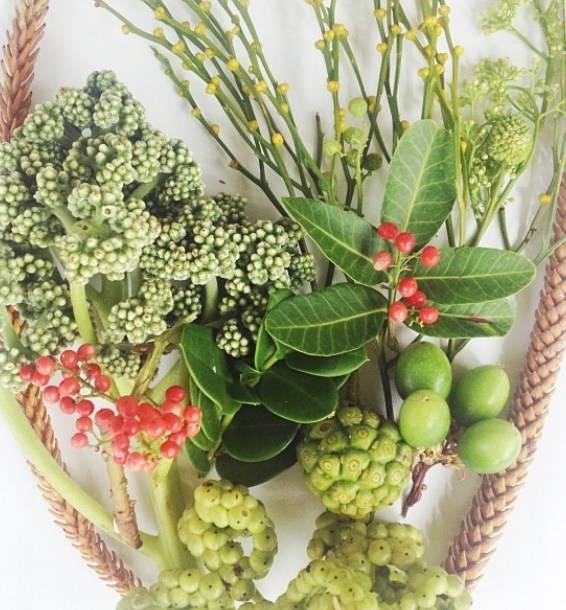 Flora Bowleys next Bloom True ~ the e-course starts Monday Sept. 30th! Five weeks painting in your own private classroom. No one critiquing~ just you, your paints and inspiration. You will have the added bonus of professional video, audio interviews and a private, online community to discuss your process with. This little promotional video sums it up nicely! https://vimeo.com/73065643 BUT this is my all time favorite video of Flora painting from start to finish https://vimeo.com/58224937 I have been lucky enough to take both Flora's e-course and live class. While I loved meeting her in person, I found the online setting to be more conducive to me letting go and playing. No distractions from other classmates or being influenced by what others were doing. Lots of time to review the videos at your own pace and do what she does. I also felt I received enough critique from Flora and my online community as both were quick to answer any questions I had. Put the music on, move and explore your creative side... If you paint at night I would even suggest a few glasses of wine because it just never hurts! I hope this helps to give you an idea of what to expect during Flora's course. I have many a blog post discussing my trials and tribulations with the whole intuitive way of painting. 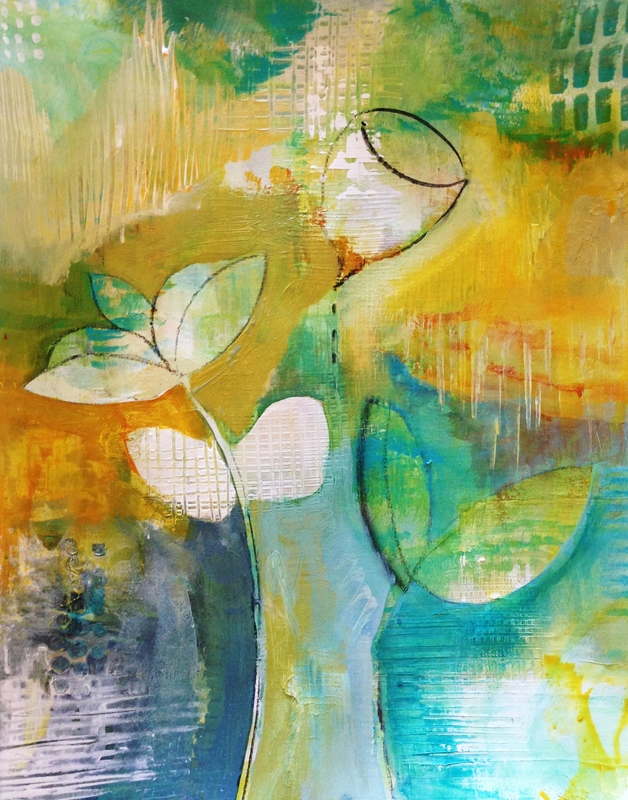 Just "search" intuitive painting, Flora Bowley, Bloom true ,Brave Intuitive you or mark making in my "search" box (in the side column to the right) I think everything is there to answer any questions you may have. If you are still curious, please feel free to ask away, either below in comments or, directly at jules@bollah.com. P.s. I have affiliated with Flora and Do what you love to help promote Flora's Bloom True classes! This is as close as I could get to buying the company:) If you are interested in taking her class please mention me or click through my site here to register. Help me save up to take more Do what you love courses! I am a little addicted and need help to pay for my art habit!